In the medieval village.history, delicacy, surprise and magnificence ! In Castelsardo the charm of the historical center of the only medieval village of Sardinia, with its narrow streets and stone pavement, ranked among the most beautiful villages in Italy,you can find a beautiful apartment next to the fortress, in a really beautiful context. Recently refurbished, retaining and highlighting the details related to its age, is equipped with every comfort. Located on the first floor of a house in 1500, consists of a large kitchen living room with a sofa bed, double bedroom with dressing room and bathroom. For room size, possibility to add one bed of emergency. 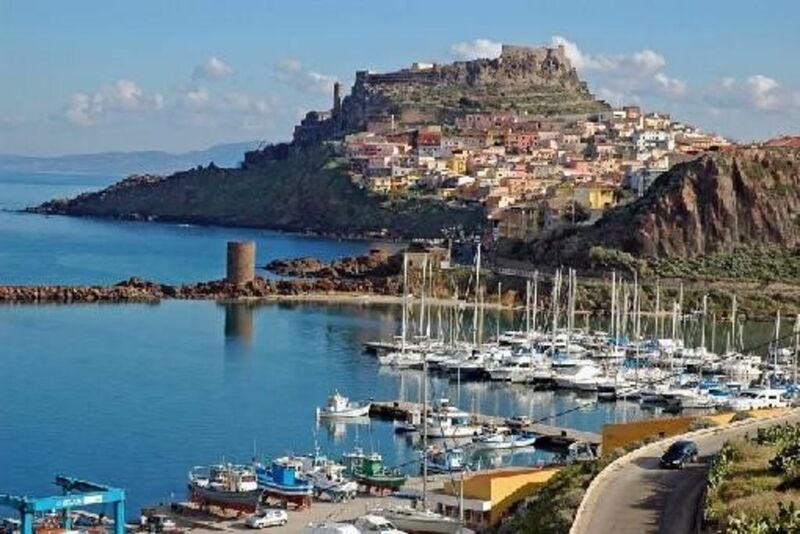 Castelsardo is a wonderful medieval village of Sardinia up north in Anglona region. Its position makes it a good stop on a tour beetween west Sardinia and the islands such as: Stintino, Asinara island, Santa Teresa di Gallura, La Maddalena, Porto Torres, Alghero. From Alghero airport you can reach Castelsardo by car (by renting it) or by bus. Its rocky coastline appears in all its splendor in spring when mimosa trees and poppies are in bloom. The old town is on the pedestrian area and is still preserved in its old city walls on the headland infact its fortified coastal position is very appealing. Inside the walls there are picturesque old buldings, atmospheric lanes and stairways, enticing café, restaurant tables set around corners and on terraces, old women sit in doorways weaving baskets, beckoning tourists over to admire their displayed goods often very elaborate and attractive far superior to the contents of souvenir shops. The village’s principal touristic sight is the Castello dei Doria built by the Doria family of Genoa. The Castle houses the Museo dell’intreccio del Mediterraneo, a museum of basket-weaving, an important local handicraft. A local town bus runs several times a day, up to the Castel, around the town and out to the nearby beach resort Lu Bagnu. Don’t miss to visit the inland you will find the village of Martis where the Church of San Pantaleo can be visited. The village houses the Diocesan museum, a permanent exhibition. Moreover you will find the pietrified forest of Martis and Perfugas. If you want to relax, at 15 km far from Castelsardo, at Santa Maria di Coghina there is a thermal bath. During your visit in Perfugas you can taste good homemade cheese and wine! This traditional apartment is very clean, comfortable and spacious. We received a lovely welcome from the family who were on hand if any assistance was required. There is a double and twin bedroom, lounge, well equiped kitchen and modern bathroom. It was obviously 'grandma's house', and is exactly as per the pictures. The double bed was one of the most comfortable I have ever slept in! The apartment is on the hill, above Santa Margherita, with a regular service bus into town. 16 euros per person bought a weekly bus ticket, that allowed you to travel around the area, for as many journeys as required. We used the bus to go to Portofino, which was mucg easier than going by car. There is a local general store nearby, where you will get everything you need, fresh bread every day, meats, toiletries etc etc. We had an excellent holiday, and felt this was good value for money. Ottimo appartamento spazioso e ben arredato situato in centro storico a Castelsardo bellissimo Borgo, un po scomodo perchè tutta zona ztl..... ma si sapeva. E' fornito di lavatrice, stendino e ferro da stiro tutto molto utile. No zona Wi-Fi poca connessione internet.... Titolare anche se lontana molto presente per ogni problema....noi siamo stati bene anche se contornato da ristoranti a volte rumorosi fino a notte tarda....Un elogio ai cittadini di Castelsardo e non solo perchè tutti squisitamente gentili. ... è stato un piacere ospitarvi nel nostro appartamento e poter fare due chiacchiere con voi anche se solo per telefono. Speriamo prima o poi di incontrarvi anche in Liguria e passare qualche giornata insieme. Personnes très acceuillantes .Appartement trés pratique,à coté de tous les commerces.Vie de village trés sympa,beaucoup d'animations (concerts ,feux d'artifice ,conteuses...).Pas de parking devant l'appartement mais toujours possibilité de se garer à proximité. Dépaysement assuré.Je le recommande. Merci Laurence, pour avoir apreciée ma maison et Castelsardo.... aussi moi je l'aime beaucoup. Mon amie Maria qui se occupe de mes amis est tres accueillante comme toutes les habitants du petit village. tres joli appartement tres bien restaure et tres bien situe dans vieille ville Castelsardo.au mois de mars tres tranquille car encore peu de touristes!avons apprecie le calme et la situation. L'appartement est en très bon état, très bien équipé et très joli bref il y fait bon vivre. N'hésitez pas. bonne description de la location.Appartement propre et bien équipé conforme au descriptif,propriétaire et personne sur place très gentils, agréables et accueillants . A recommander à un ami . Appartement situé au centre de Castelsardo donc animations d'une ville . Castelsardo, the Asinara Gulf, is situated in a position from where you can reach various tourist places like Stintino, Alghero, Santa Teresa di Gallura, La Maddalena, etc..
Easy movements, too, with public transports. Castelsardo,is famous for the characteristics and peculiarities of its historical center, is a popular tourist destination in all seasons. Even today, many feel, and practiced the ancient folk events, particularly the ancient tradition LUNISSANTI that takes place during Easter. Un premier acompte de 20 sera versé à la réservation , mais n'est indispensable, le solde du séjour sera régleé à l'arrivée. En haute et en très haute saison,les location se font au minimun sur 7 nuits et n'importe pas quel jour de la semaine commencent. Les logement sont disponibles le jour d'arrivée à partir de 16h. et doivent être libérés la matin du depart avant 10,30 heures. la maison est parfait pour 4 personnes, mais il y a la possibilitè d'ajouter 1 ou 2 lits d'urgence, au cas 15,00 euro en plus par nuitèe par personne.